Discover the stunning natural beauty and rich culture of Hawaii’s most spectacular islands on this 13-day escorted tour. 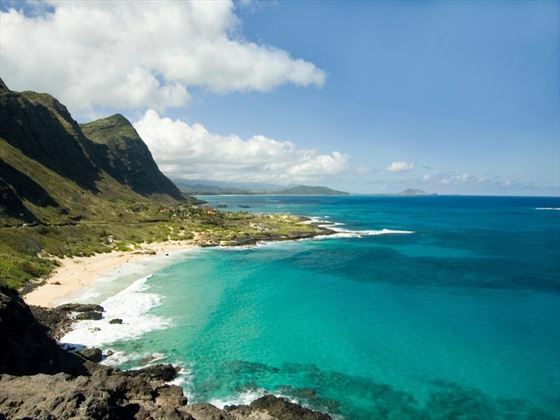 Experiencing the contrasting islands of Oahu, Kauai, Maui and Hawaii Island, this exciting and incredibly scenic journey encapsulates some the most significant and impressive attractions Hawaii has to offer. You’ll dine on authentic cuisine, visit mighty volcanoes, be awed by the views over canyons and lookout points, and have the opportunity to take part in unique activities. You and your group will be accompanied by an experienced tour guide and will meet with local specialists for a chance to really learn about your surroundings. 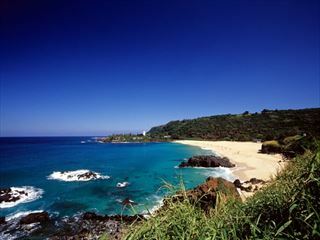 A wonderful Hawaiian adventure, this tour promises a host of amazing experiences and sights along the way. Arrive at Honolulu airport and transfer to your hotel to check-in. Afterwards, the day is yours to spend exploring Waikiki Beach and relaxing. At 6pm, meet with your tour guide and group for a Hawaiian-style welcome reception. Explore the island of Oahu today, passing through the colourful villages and pineapple plantations on the island. Head to Pali Lookout for incredible vistas of the surrounding scenery and the Battle of Nuuanu site, before heading back to Waikiki where your evening is free. 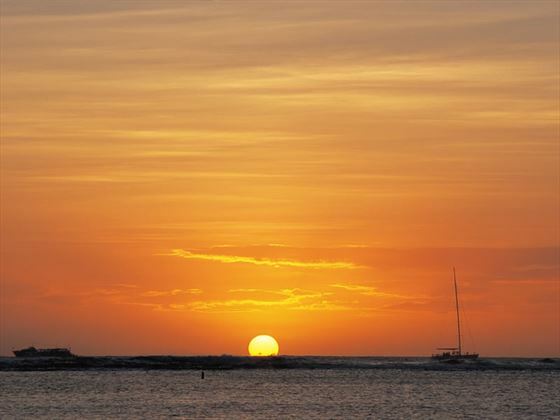 Perhaps you may enjoy a sunset swim, a spot of shopping or dining in Waikiki for a classic Hawaiian meal. Spend today getting to know Honolulu with the choice to take part in one of several optional activities, including a submarine tour, a guided sightseeing trip to the picturesque East Coast of the island or an evening cruise to take in the sunset. In the evening, dine with your tour companions at a local restaurant for dinner. Start the day visiting the site of Pearl Harbour and the USS Arizona Memorial which serves as a moving tribute to the military personnel who tragically lost their lives in the 1941 attack. 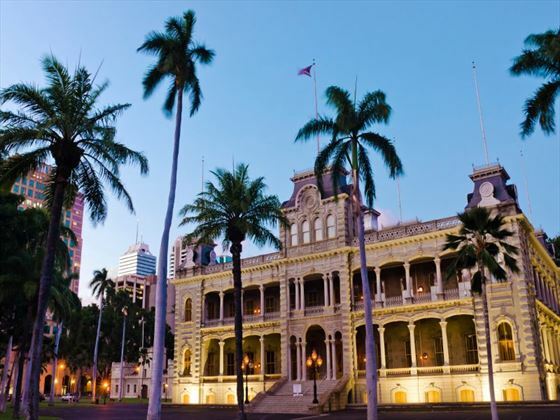 After a drive through the National Memorial Cemetery of the Pacific located in Punchbowl Crater, return to Honolulu to visit a few of the top attractions including Iolani Palace, the King Kamehameha I statue and the state capitol building. 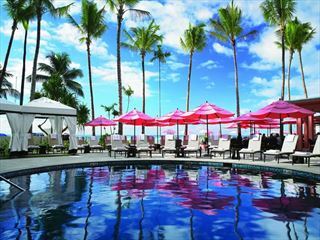 The remainder of the day is at leisure, to enjoy the attractions of Waikki Beach - watch the surfers, sip a cocktail, indulge in some shopping or sample one of the many bars and restaurants. Take a short flight to the Big Island of Hawaii this morning, where you’ll embark on an orientation tour of the seaside village of Kailua-Kona followed by a spot of shopping in the quirky boutiques. Kona is well-known for its delicious coffee and you’ll have the opportunity to visit a local coffee plantation with a specialist to learn more about the process of growing the beans. Later on, check in at your hotel at enjoy some free time, perhaps with a visit to the resort’s main attraction – the manta rays. Enjoy some free time in Kona today, with plenty of options to choose from: go snorkelling, take a helicopter ride over Big Island to see the contrasting landscapes of jungle and volcano, or enjoy the resort facilities and lounge by the pool. Visit the Manta Ray Learning Centre for a presentation from a local specialist to learn more about these fascinating creatures. Bid farewell to Kona this morning as you journey to the Hawaii Volcanoes National Park, a UNESCO World Heritage Site that’s home to the world’s largest volcano. En-route visit the southernmost bakery in the United States and admire the black sand beaches that this area is known for. Upon arrival at the park, you’ll have the chance to learn about the geology of this area followed by a visit to an interpretive museum. Enjoy lunch at The Rim restaurant which overlooks the live Kilauea caldera before travelling to the airport at Hilo to board your flight to Maui. 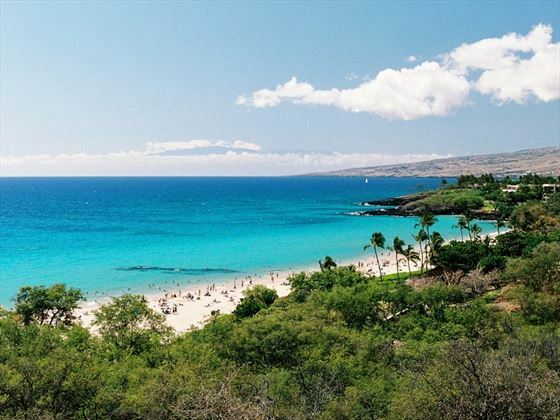 Enjoy a full day in Maui, creating your own itinerary which may include a wander along the picture-perfect beaches, a visit to the old whaling village of Lahaina or a choice of optional experiences offered – your tour guide will be on-hand to help you decide how best to spend your day if you’re looking for some inspiration. This evening join your fellow travellers for a traditional Hawaiian Luau and regional meal, featuring a buffet and tropical cocktails, followed by song and dance from Hawaii and the South Pacific. Your morning is at leisure today before you embark on a brief afternoon flight to the Garden Isle of Kauai to check-in at your hotel. On day 11, you’ll visit Grove Farm Estate which will include a private tour of the historic sugar cane plantation. 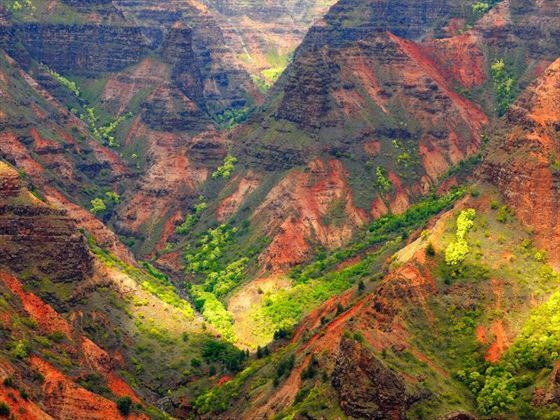 Later, visit Waimea Canyon to view one of Hawaii’s most majestic geological wonders, filled with valley gorges and colourful bluffs. 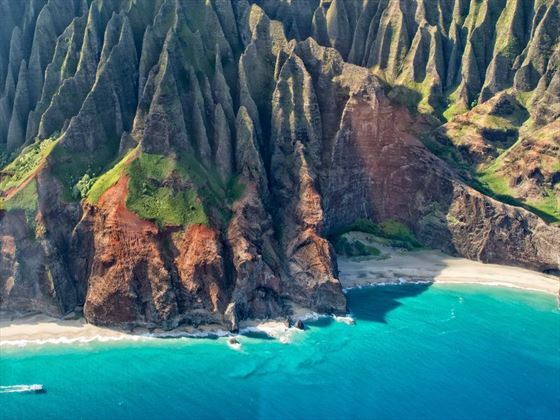 Spend a free day on Kauai to immerse yourself in this beautiful island - you'll understand why it is the setting for so many films and TV shows. You may choose to travel by helicopter to the Na Pali Coast over Hanalei, where movies such as Jurassic Park were filmed – but don’t forget to leave yourself some time to relax by the pool in the resort’s beautiful gardens! In the evening, join your tour guide and group for a farewell dinner. 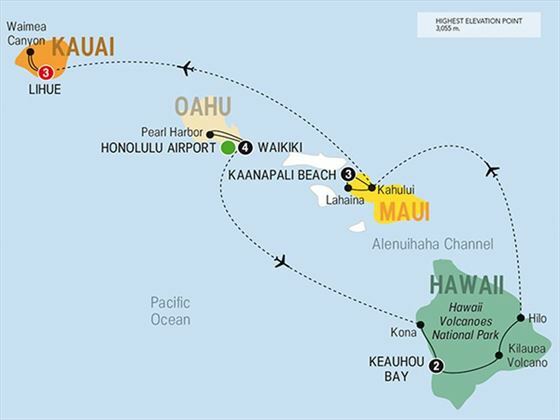 Depart from Kauai today and make your way to the airport for your departing flight. Early Booking Offer Book and pay for your 2019 tour by 30 Apr '19 and save up to £300pp Discounts included in advertised prices.